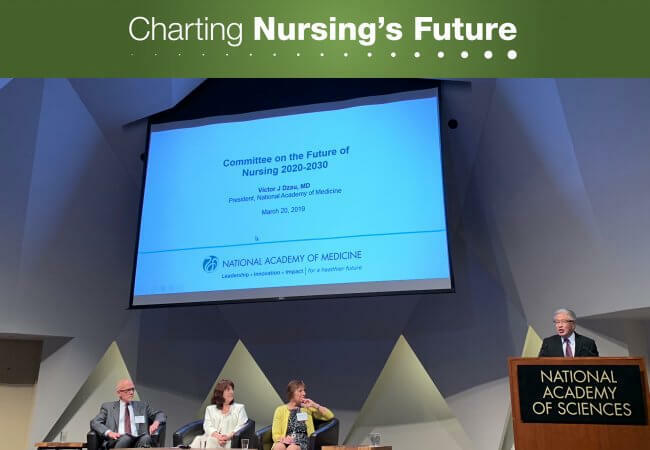 Victor Dzau, MD, president of the National Academy of Medicine, speaks at the launch of the Future of Nursing 2020–2030 study. Photo credit: Scott Tanaka. Pioneering public health nurse Lillian Wald wrote these words 85 years ago, and they still resonated last week as nurses and others gathered at the National Academy of Medicine (NAM) for the public launch of a new study. The Robert Wood Johnson Foundation (RWJF) is funding The Future of Nursing 2020–2030 to chart a path for the nursing profession over the next decade. That path will rest, at least in part, on the proud tradition of public health nursing, which has worked to address both the social needs of individual patients and the social conditions that prevent people from leading healthy lives in the first place. The National Academy of Medicine committee’s work will culminate in a consensus report describing how nurses can contribute to building a Culture of Health, reducing health disparities, and improving the health and well-being of the U.S. population in the coming decade. Several dozen audience members and leaders from nursing organizations–representing practice, education, and research–also shared their thoughts on the scope of the committee’s work. Their concerns ran the gamut—from changing the economics of health care delivery to make community-based nursing sustainable to workforce challenges such as increasing diversity, reducing turnover, and eliminating burnout. As part of its charge, the committee will examine lessons learned from the Future of Nursing: Campaign for Action, which grew out of an earlier report by the then-named Institute of Medicine, The Future of Nursing: Leading Change, Advancing Health, published in 2011. The Campaign is a national initiative of AARP Foundation, AARP and RWJF, and is coordinated by the Center to Champion Nursing in America (CCNA), an initiative of those same organizations. The Future of Nursing report, also funded by RWJF, has been highly influential globally. In line with the report’s recommendations, today’s nurses are more educated than ever before; fewer state and federal barriers block access to care from advanced practice registered nurses; more nurses are serving in leadership capacities, especially on boards; and the nursing workforce is becoming more diverse. 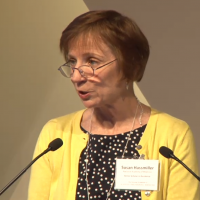 Campaign leader Susan Reinhard, PhD, RN, FAAN, highlighted the Campaign’s impact on nursing since the then-named Institute of Medicine released the first report on the future of nursing. Photo credit: Mary Boyle. Susan Reinhard, PhD, RN, FAAN, senior vice president and director, AARP Public Policy Institute, and chief strategist at CCNA, told meeting attendees, “Over the last three years, we’ve been building on those [accomplishments] to delve deeper into health equity, the social determinants of health, and population health.” These priorities are among those the committee will consider. Mary Wakefield, PhD, RN, FAAN, acting United States Deputy Secretary of Health and Human Services during the Obama administration, is co-chairing the committee with David Williams, PhD, MPH, Florence Sprague Norman and Laura Smart Norman Professor of Public Health and Chair, Department of Social and Behavioral Sciences, Harvard T.H. Chan School of Public Health. Campaign leader Susan Hassmiller, PhD, RN, FAAN, said nursing must continue to build a broader coalition among other professions and sectors. 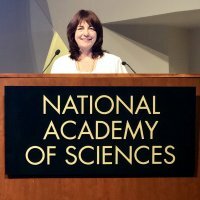 Hassmiller will serve on the leadership team in her new role as the NAM Senior Scholar-in-Residence and Special Advisor on Nursing to the National Academy of Medicine President. More than 3,000 people registered to attend via NAM’s webcast of the launch, and several “watch parties” were held throughout the nation. Later this year, the public will be invited to attend three regional town hall meetings. Written comments and evidence relevant to the committee’s charge may be submitted via email at futureofnursing2030@nas.edu. The public is encouraged to also sign up for alerts to get specific information about forthcoming events.